The Derek Fisher vs Matt Barnes episode in October 2015 was an ugly one. Barnes drove nearly two hours to his former Los Angeles home, where he reportedly got into a physical altercation with Fisher, his ex-teammate. Fisher and Barnes played together on the Los Angeles Lakers for two seasons, a time when they were friendly, and Fisher was now beginning a relationship with Barnes’s recently estranged wife Gloria Govan, once a star on the VH1 reality TV show Basketball Wives. Barnes and Govan were still legally married, with custody battles to come. NBA players and fans quickly took Barnes’s side, ignoring his own record that includes a domestic violence arrest five years prior. His toxic, vengeful mission, however, was interpreted with righteousness, no doubt in part because of Fisher’s sordid reputation. Fisher, currently the coach of the WNBA’s Los Angeles Sparks and a freshly minted executive at a predatory Denver-based entity called Luxury Asset Capital, has a rich history of not just personal betrayals, but professional subterfuge that undermines the collective bargaining power of his peers. “Man!!!! Hell Naw!!!! Stay away from this!!! !” tweeted Jared Dudley, upon learning of Fisher’s new job at Luxury Asset Capital. Dudley is a thirty-three-year-old veteran for the Brooklyn Nets, with a strong reputation as a “culture guy” who educates younger players about the peaks and perils of the NBA lifestyle. 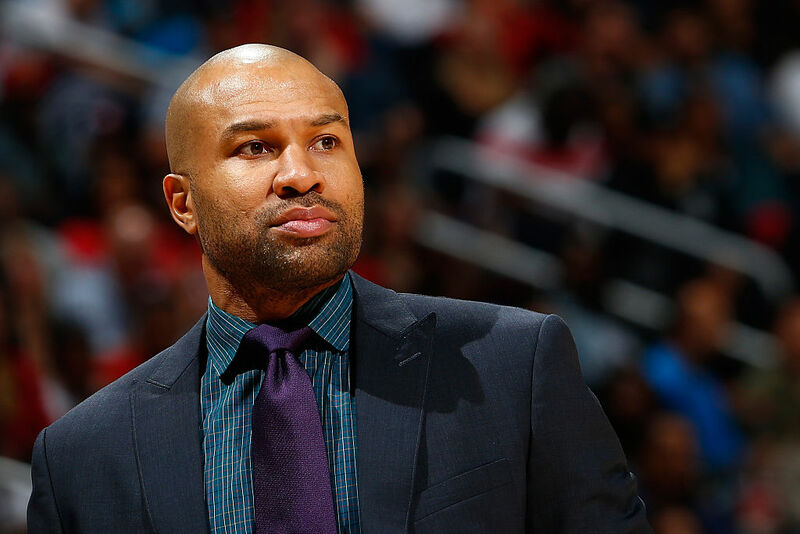 “Derek Fisher sold us out in the CBA now he selling us out again,” tweeted Baron Davis. Davis, a teammate of Fisher’s during the 2004–05 season with the Golden State Warriors, was referring to Fisher’s highly scrutinized role as the president of the NBA Players’ Union during the league’s 2011 work stoppage. Amid negotiations long enough to shorten the season by sixteen games, Fisher was accused of working privately with league commissioner David Stern. It was reported that Fisher assured Stern he could deliver an agreement for a 50–50 split of basketball-related revenue between players and owners, a figure less generous than the 52–48 premise under which the union had been previously operating. Fisher was not in a position to decide anything unilaterally for his union anyway, but his hands were all over the negotiations, and the widely held suspicion that he was willing to sell his peers out inured him to most of them forever. When Fisher got a prestigious five-year, $25 million head coaching contract with the New York Knicks, a job for which his qualifications were questionable, a mere ten days after playing his final professional game in 2014, it did not exactly reverse the feeling that he had leveraged his high position in the union against players for future personal gain. It can also easily be argued that the inflation in head coaching salaries that Fisher benefited from in 2014 was directly related to the collective bargaining agreement he helped owners reach in 2011 — much of its structure was designed with recent foolhardy player contracts in mind. During summers between NBA seasons, franchises frequently strike out in their effort to sign big-name superstars like LeBron James, but then commit their excess funds to outsize deals for middling talents. This was especially true before the 2011 deal — owners were very motivated, during negotiations, by how much bad money they had thrown around the league. The new deal thus included a byzantine collection of stipulations and rules, including shorter overall terms for player deals and various individual salary caps that essentially protected owners from paying players too much, but left more money lying around for executives and coaches. In 2016, Fisher was fired from his coaching job after compiling forty wins and ninety-six losses, with no playoff appearances. Months later, he finalized a costly divorce from his wife Candace, who said Fisher “blindsided” her by moving his belongings out of their house in the middle of the night. Fisher is now perhaps too financially stricken by his divorce to even pretend to do anything but viciously skim from the frequently mismanaged storm-glut of capital that his professional realm creates. Luxury Asset Capital has hired Fisher as the executive vice president of a new sports and entertainment division that offers short-term loans ranging from $50,000 to $5 million using assets such as contracts, pensions, cars, watches, fine art, jewelry, and “real estate (in specific situations)” as collateral. The firm’s website boasts quick liquidity for high-value possessions and assets, which makes them sound quite a bit like a mega-scale pawn shop. “Often times,” the site reads, “traditional forms of financing are too slow, burdensome and invasive, or have negative tax or other consequences that make them less than ideal or unviable choices, particularly when time is a factor”; “Doing business with us is straightforward and discreet, requiring little paperwork, typically no credit checks, virtually no personal or business information and no waiting period.” A probably obvious piece of personal financial advice: never give money, or anything, to a company that uses this kind of language. Fisher, in defense of his new position, has attempted to evoke pathos and nuance to show what Luxury Asset Capital does. “A lot of athletes have gone broke because athletes have trusted their advisors to manage their money because we’re not experts in it, and a lot of guys have been taken advantage of by their advisors,” he told the Guardian. We’re making this assumption, and for me in particular as a man of color, we’re making this assumption that it’s always related to athletes making poor decisions, driving around in Bentleys and jewelry and cars and sometimes the assets and the money disappear for other reasons: advisor was embezzling money; there was a divorce event that half of his assets, marital property, are gone. And now life looks different and he has to figure out how to navigate all these moving parts. The company cites loan figures from 50–70 percent of collateral value, but provides scarce and unclear information about interest rates on their webpage. That Fisher villainizes the financial “advisor” class of his sport while clearly joining their ranks, in all ways but nominally, speaks to just how insidious his intentions are. Like all traitors to solidarity, his surest shot at success is to obfuscate; to fudge the line between labor and management, between ally and predator; to conjure enough personal sympathy to make you soften your grasp on the hard edges of principle.